Many questions remain on the issue of LaVoy Finicum’s shooting, and on the issue of FBI “justifications” of what many have noted was an ambush and pre-planned political execution. Sibel Edmonds and Peter Collins of Boiling Frogs Post discuss some of the questions including why the FBI sought to stop the Bundys and Finicum on a roadway instead of at the refuge, why the order was given to turn off body-cameras, and why there were snipers in the trees and up the slope if it was a “traffic stop.” Was there a pre-determined intent here, to keep the Harney County group from speaking to and inspiring other counties locally to take action against BLM/Federal corruption that they were uncovering? State of the Nation explores further. David Knight of the Alex Jones show discusses the cell phone video of the shooting and comments on the shooting: This is a war of our government against the American people–we need to wake people up! Can we as a nation stay on this case and continue to seek and obtain justice–can we begin to openly discuss and reveal FBI cover-ups and lies, government acts of aggression, encroachment, and corruption, and can we make it clear as David Knight notes that “they are the criminals”–can we turn this injustice around in other words? Can we begin to reclaim and restore the US to a state of real peace, lawfulness, and justice? Sibel Edmonds aims to continue following the case, so please send any further information her way–links to Boiling Frogs Post below. Links to a few related videos below. The U.S. Federal Government is no stranger to adding insult to injury. In fact, doing so has become their signature MO in practically everything they touch. Such is the case with first carrying out the assassination of patriot LaVoy Finicum, and then covering up the cowardly murder. 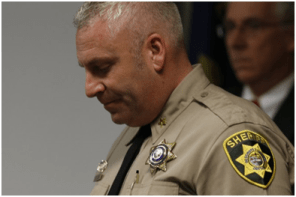 There is no question that the FBI, working in tandem with the Oregon State Police, fastidiously planned out the execution of Finicum. All of the highest integrity evidence indicates that his killing was a calculated hit on one of the greatest heroes of the American patriot movement. The FEDs truly felt they had no choice but to snuff out a powerful voice of the coming 2nd American Revolution. Visit State of the Nation for more, with links to videos and other articles. Peter B. Collins presents: Todd Macfarlane & Sibel Edmonds Hours after the news conference where Oregon investigators declared the January 26 roadblock killing of LaVoy Finicum “justified”, Sibel Edmonds joined Peter B. Collins in a conversation with Todd Macfarlane, who had been representing the Finicum family. Unlike the hand-picked reporters at the briefing, we raise major questions about the justifications and review important details of the additional video and audio recordings released today, as well as the stunning revelation that 2 FBI agents lied to investigators (and 3 other agents backed them up) repeatedly in denying they had fired their weapons, leading to a fresh investigation of FBI wrongdoing by the FBI. Audio clip here. David Knight of the Alex Jones Show/includes cell phone video from inside LaVoy’s car: We have to stand up to the violence the Government inflicts on us…we’ve got to educate the public. Kris Anne Hall: Taking back the Narrative/an older post, before the Finicum shooting/at time of the Malheur Refuge occupation–The ultimate arbiters of the Constitution are the States themselves…it is time for us to understand the proper role and function of our government…. It is time to know the facts, the time to stand for the truth. Do we want an unlimited Federal Government, or do we want to stand for what is right? It is time to defend the Republic….We are the holders of power, we are the owners of our property–and when a government dictates property, we are nothing but slaves. This entry was posted in Waking Up and tagged ......, Alex Jones show, Constitution, David Knight, FBI, Kris Anne Hall, LaVoy Finicum, Oregon State Police, Peter Collins, Sibel Edmonds, State of the Nation, Todd McFarlane. Bookmark the permalink.